Reducing weight is an effective way to increase payload. 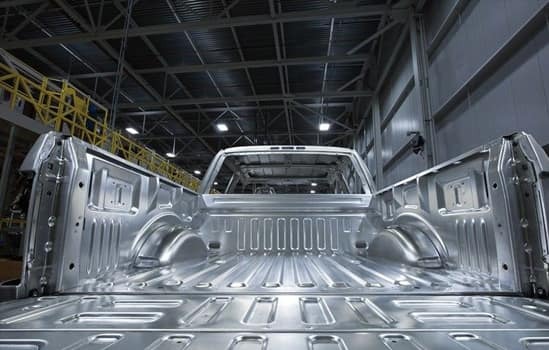 And that’s what resulted from cutting the weight of the F-150 body with high-strength, military-grade, aluminum alloy. Greater strength with less weight helps achieve a best-in-class* payload rating in F-150 models powered by the legendary Ford 5.0L V8. The 5.0L now features a direct-injection system designed to extract as much power as possible from every drop of fuel, and generates power ratings of 395 horsepower and 400 lb.-ft. of torque. Backing up a trailer involves navigating two vehicles at the same time – the truck going one way and the trailer going in the opposite direction. Whether you’re a novice or a seasoned pro at this often tricky maneuver, the available class-exclusive* Pro Trailer Backup Assist™ makes it as easy as turning a knob. ** Simply rotate the knob left or right in the direction you want the trailer to go. 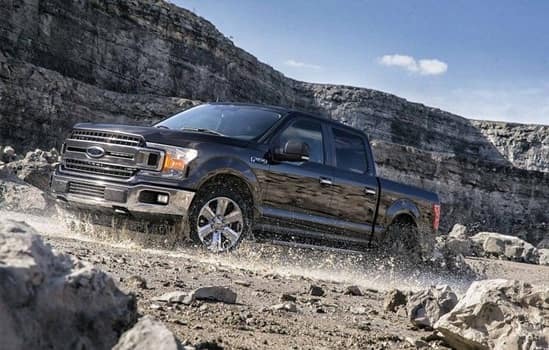 F-150 is the first pickup truck to offer this breakthrough feature. *Class is Full-Size Pickups under 8,500 lbs. GVWR based on Ford segmentation. **Driver-assist features are supplemental and do not replace the driver’s attention, judgment and need to control the vehicle. The available 360-degree camera with split-view display* uses four cameras – one in the grille, tailgate, and under each of the sideview mirrors. 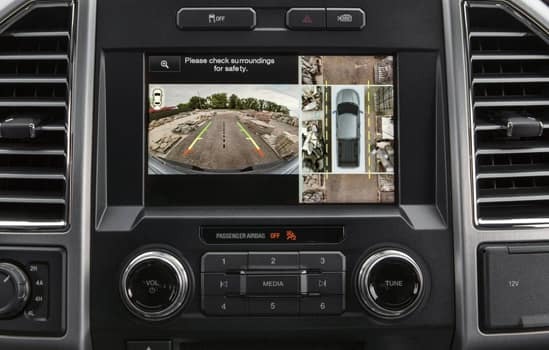 The system enables you to see all sides of the truck by stitching the images together and displaying them on a center stack screen. It’s useful when maneuvering in tight spaces and on trails. Also helpful is the included hitch assist feature that provides a dynamic sight line to help direct your hitch ball to the trailer receiver. *Cameras only operate at speeds under 6 miles per hour. Driver-assist features are supplemental and do not replace the driver’s attention, judgment and need to control the vehicle. 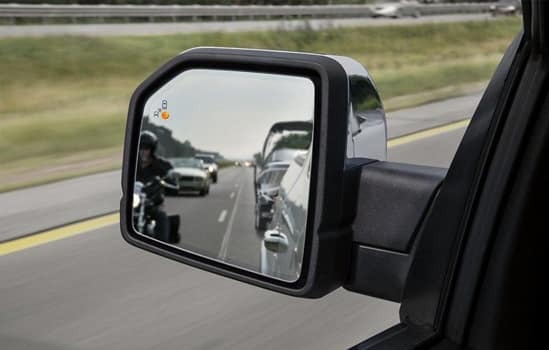 Available BLIS* (Blind Spot Information System) signals you in the outside mirror when a vehicle is detected in a blind spot — and provides coverage for the truck you’re driving as well as the trailer you’re towing. The cross-traffic alert feature can detect a vehicle passing behind when you’re slowly backing out of a driveway or parking place. F-150 offers technologies to assist you in unexpected situations: (1) Pre-Collision Assist with Pedestrian Detection* scans the road ahead. 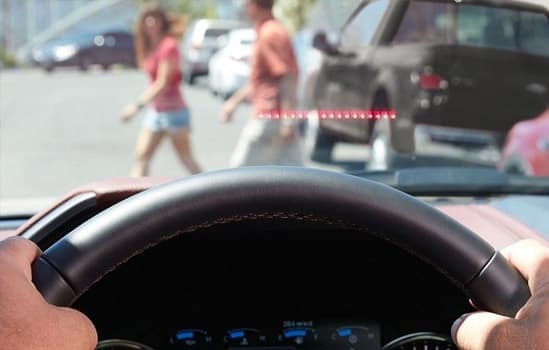 If the sensors detect a potential collision, you get a visual warning on the windshield as well as an audible alert. And the brakes precharge and increase sensitivity to provide full responsiveness when you brake. If corrective action is not taken and a collision becomes imminent, the brakes can apply automatically. (2) Lane-Keeping System* vibrates the steering wheel or gives torque sensations, or both if you choose, when you drift too close to a lane marker. *Driver-assist features are supplemental and do not replace the driver’s attention, judgment and the need to control the vehicle. While Pre-Collision Assist with Pedestrian Detection may be especially helpful in unexpected situations, it does not replace the driver and has limitations, including nighttime, low and harsh lighting conditions, vehicles moving in a different direction and certain weather conditions. Doing something the right way often results in multiple benefits. Case in point: going from steel to high-strength, military-grade, aluminum alloys in the F-150 cab and bed. Hardening aluminum alloy through heat-treating produces greater strength. Working with aluminum alloy also allows engineers to increase gauge (or thickness) where needed to achieve extra strength without increasing weight. 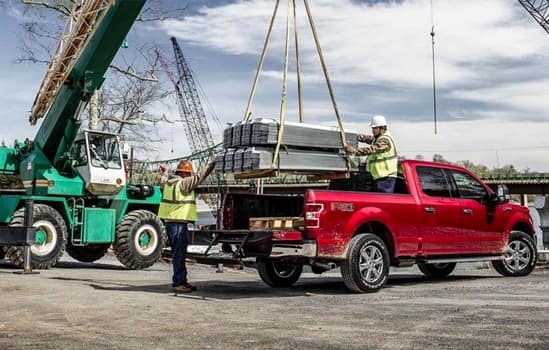 The stronger F-150 weighs up to 700 lbs. less than the previous generation, resulting in greater power-to-weight ratio, enhanced fuel efficiency, plus higher maximum payload and tow ratings that are best in class. * Yet another benefit — resistance to dents and corrosion. The fully boxed frame is made of more high-strength steel (up to 78 percent at 70,000 psi) and larger cross sections than the previous frame. And while stronger and more rigid, this frame is also lighter by up to 60 lbs. because many of the components are fabricated using the state-of-the-art roll-forming process that minimizes weight. Shifting into four-wheel drive is as easy as turning a dial with the electronic shift-on-thefly (ESOF) system. ESOF lets you choose two 4-wheel-drive modes (4×4 low or high) as well as 2-wheel drive. LARIAT, King Ranch®, Limited, Platinum and Raptor models also include automatic 4WD mode. The FX4 Off-Road Package includes electronic-locking rear differential (locks the rear axle completely for enhanced traction at both wheels), Hill Descent Control™ , off-road tuned shock absorbers, skid plates, and “FX4 Off-Road” decal. Plus, the available 360-degree camera with split-view display is helpful when you’re maneuvering in tight spaces and on off-road trails. 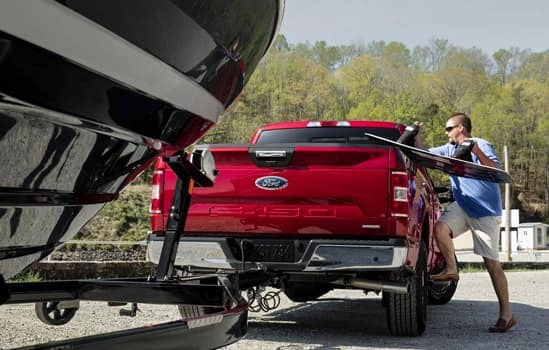 The 2018 F-150 SuperCrew earned an overall five-star crash safety rating from NHTSA. * Vehicles are evaluated on how they perform in frontal, side barrier, side-pole and rollover resistance scenarios. These are typically the most common types of crashes on American roadways. The five stars SuperCrew received represent the highest score a vehicle can get, and that provides added peace of mind. Ford engineers work to make the F-150 pickup better every year and push the competition to try to keep up on the performance front. 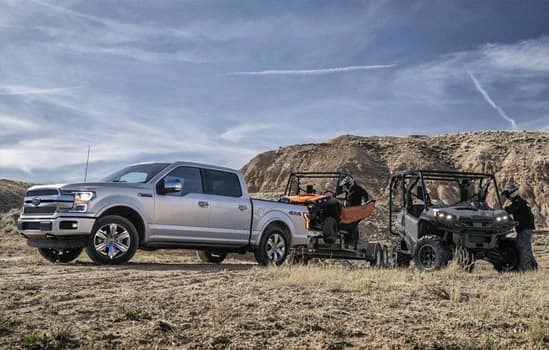 There are six engine choices, naturally aspirated and turbocharged, including the new 3.0L Power Stroke® V6 Turbo Diesel and the awesome high-output 3.5L EcoBoost ® in the Baja-bred F-150 Raptor. Auto Start-Stop Technology is on all engines. And five of the six engines feature the segment-exclusive* 10-speed automatic. *Class is Full-Size Pickups under 8,500 lbs. GVWR based on Ford segmentation. 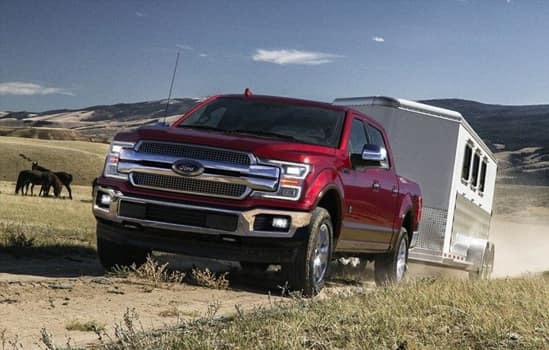 A diesel alternative enters the F-150 lineup with the new 3.0L Power Stroke Turbo Diesel engine. Optional on LARIAT, King Ranch® and Platinum models, it’s built on the legacy of the tried-and-true 6.7L Power Stroke Diesel found in the Super Duty®. This engine is designed to deliver a new level of power and capability for drivers who tow and haul frequently. It’s ready to make its presence felt – with best-in-class diesel horsepower of 250 at 3,250 rpm and best-in-class diesel torque of 440 lb.-ft. at just 1,750 rpm. That translates to impressive capability too, including best-in-class diesel towing and best-in-class diesel payload. * On top of it all, there’s a best-in-class EPA-estimated rating of 30 highway mpg**. *Max towing on F-150 LARIAT SuperCab or SuperCrew, ® 6.5′ box, 3.0L Power Stroke Diesel, 4×2, Trailer Tow Pkg. and 3.55 rear axle. Max payload on F-150 LARIAT SuperCab, 6.5′ box, 3.0L Power Stroke Diesel, 4×2. Class is Full-Size Pickups under 8,500 lbs. GVWR based on Ford segmentation. **EPA-estimated rating of 22 city/30 hwy/25 combined mpg, 3.0L Power Stroke Diesel, 4×2. Actual mileage will vary. Class is Full-Size Pickups under 8,500 lbs. GVWR based on Ford segmentation. 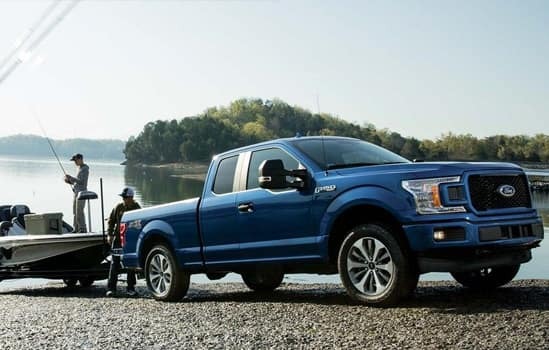 F-150 EcoBoost® and V8 engines deliver their power through an advanced 10-speed automatic transmission. 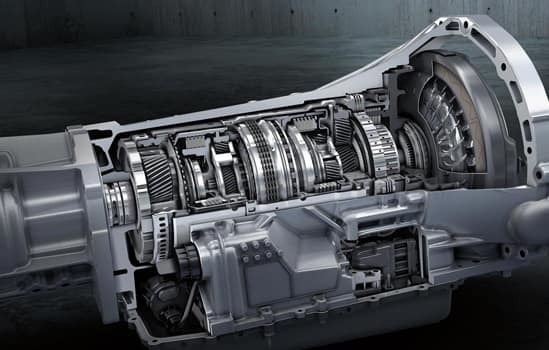 Compared with the 6-speed gearbox it replaced, the 10-speed delivers improved overall performance, with enhanced acceleration at the low and mid ranges of the power band. Features include optimized wide-span gear spacing coupled with drag-reduction actions plus three overdrive gears. What’s more, you can choose from selectable modes: Normal, Tow-Haul, Snow-Wet, EcoSelect, and Sport. 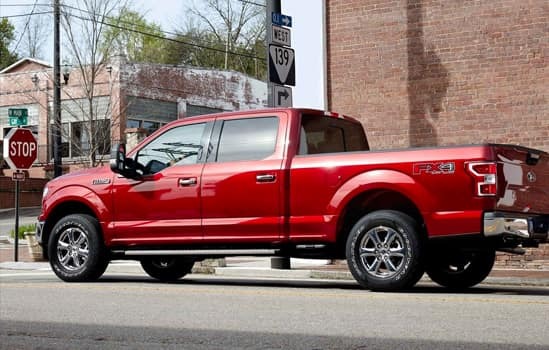 Auto Start-Stop Technology is a feature on all F-150 engines. When you come to a stop, the engine shuts off to save fuel and restarts immediately when the brake is released. Designed smart for truck applications, Auto Start-Stop deactivates when it wouldn’t be needed such as when you’re towing a trailer or running in 4-wheel drive. Thank you for shopping at Port Orchard Ford. We've built a car buying process designed around you to save you time and money. If we don’t have exactly what you’re looking for, we'll help you find the right vehicle for your lifestyle. It’s that simple. Call us today at 360.876.3000. 2019 Ford F-150 XLT 4WD, 3.31 Axle Ratio, 4-Wheel Disc Brakes, 6 Speakers, ABS brakes, Air Conditioning, AM/FM radio, Auto High-beam Headlights, Brake assist, Bumpers: chrome, Class IV Trailer Hitch Receiver, Compass, Delay-off headlights, Driver door bin, Driver vanity mirror, Dual front impact airbags, Dual front side impact airbags, Electronic Stability Control, Emergency communication system, Equipment Group 300A Base, Front anti-roll bar, Front Center Armrest w/Storage, Front fog lights, Front License Plate Bracket, Front wheel independent suspension, Fully automatic headlights, GVWR: 7,050 lbs Payload Package, Illuminated entry, Low tire pressure warning, Occupant sensing airbag, Outside temperature display, Overhead airbag, Panic alarm, Passenger door bin, Passenger vanity mirror, Power door mirrors, Power steering, Power windows, Radio data system, Radio: AM/FM Stereo w/6 Speakers, Rear step bumper, Remote keyless entry, Security system, Speed control, Speed-sensing steering, Split folding rear seat, Steering wheel mounted audio controls, SYNC 3, Tachometer, Telescoping steering wheel, Tilt steering wheel, Traction control, Tray Style Floor Liner, Variably intermittent wipers, Wheels: 17" Silver Painted Aluminum. *The advertised price does not include sales tax, vehicle registration fees, finance charges, and any other fees required by law. A Negotiable Documentary Service Fee in an amount up to $150.00 may be added to the sale price or capitalized cost. We attempt to update this inventory on a regular basis. However, there can be lag time between the sale of a vehicle and the update of the inventory.